• Lower end of the thigh bone. This bone is called the femur. The replacement part is usually made of metal. • Upper end of the shin bone, which is the large bone in your lower leg. This bone is called the tibia. The replacement part is usually made from metal and a strong plastic. • Back side of your kneecap. 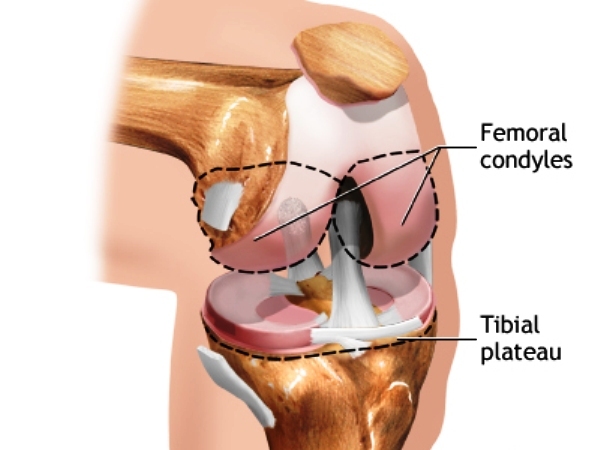 Your kneecap is called the patella. The replacement part is usually made from a strong plastic. • General anesthesia. This means you will be asleep and unable to feel pain. • Regional (spinal or epidural) anesthesia. Medicine is put into your back to make you numb below your waist. You will also get medicine to make you sleepy. And you may get medicine that will make you forget about the procedure, even though you are not fully asleep. • Move your kneecap (patella) out of the way, then cut the ends of your thigh bone and shin (lower leg) bone to fit the replacement part. • Cut the underside of your kneecap to prepare it for the new pieces that will be attached there. • Fasten the 2 parts of the prosthesis to your bones. One part will be attached to the end of your thigh bone and the other part will be attached to your shin bone. The pieces can be attached using bone cement or screws. • Attach the underside of your kneecap. A special bone cement is used to attach this part. • Repair your muscles and tendons around the new joint and close the surgical cut. • You are having pain from knee arthritis that keeps you from sleeping or doing normal activities. • You cannot walk and take care of yourself. • You understand what surgery and recovery will be like. 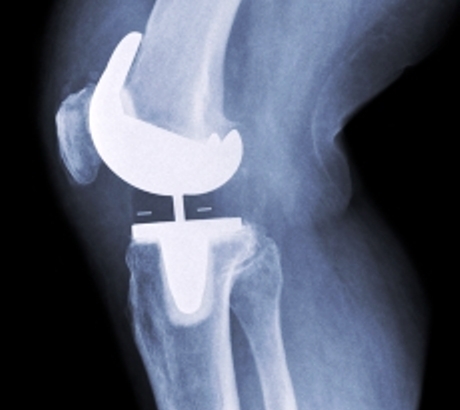 Most of the time, knee joint replacement is done in people ages 60 and older. Younger people who have a knee joint replaced may put extra stress on the artificial knee and cause it to wear out early. • Two weeks before surgery you may be asked to stop taking drugs that make it harder for your blood to clot. These include aspirin, ibuprofen (Advil, Motrin), naproxen (Naprosyn, Aleve), blood thinners such as warfarin (Coumadin), and other drugs. • You may also need to stop taking medicines that can make your body more likely to get an infection. These include methotrexate, Enbrel, or other medicines that suppress your immune system. • Ask your provider which drugs you should still take on the day of your surgery. • If you have diabetes, heart disease, or other medical conditions, your surgeon will ask you to see the provider who treats you for these conditions. • Tell your provider if you have been drinking a lot of alcohol, more than 1 or 2 drinks a day. • If you smoke, you need to stop. Ask your providers for help. Smoking will slow down wound and bone healing. Your recovery may not be as good if you keep smoking. • Always let your provider know about any cold, flu, fever, herpes breakout, or other illness you have before your surgery. • You may want to visit a physical therapist to learn some exercises to do before surgery. • Set up your home to make everyday tasks easier. • Practice using a cane, walker, crutches, or a wheelchair correctly. • You will most often be asked not to drink or eat anything for 6 to 12 hours before the procedure. • Take the drugs you have been told to take with a small sip of water. • You will be told when to arrive at the hospital. You will stay in the hospital for 3 to 4 days. During that time, you will recover from your anesthesia and from the surgery itself. You will be asked to start moving and walking as soon as the first day after surgery. 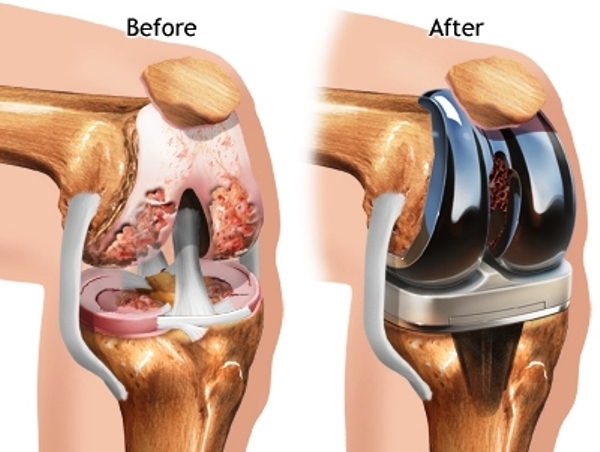 Total knee replacement; Knee arthroplasty; Knee replacement - total; Tricompartmental knee replacement; Subvastus knee replacement; Knee replacement - minimally invasive; Knee arthroplasty - minimally invasive; TKA - knee replacement; Osteoarthritis - replacement; OA - knee replacement.